When one thinks of “influence” concerning Asian and Western art, one tends to think of Western inroads into traditional Asian styles and subject matter. 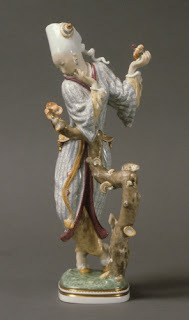 However, Western art has been influenced enormously by Asian art ever since Western Europeans began trading with China and Japan in the 18th century, and since the US forcibly opened China and Japan to trade with the West in the 1800s. 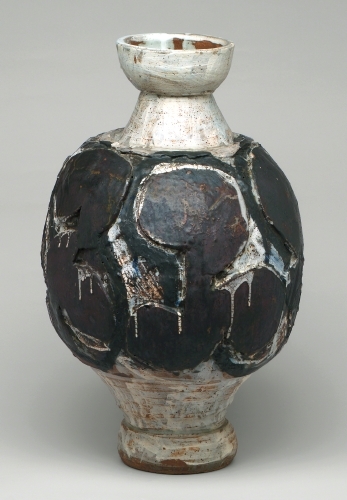 I’m using this sake pot by Peter Shire, an obvious reference to Japan, as a jumping off point for a survey of a variety of Western artists influenced by Japanese, Chinese, and Korean art over the years. Shire, born and raised in California, has been a master of ceramic arts since the 1970s. 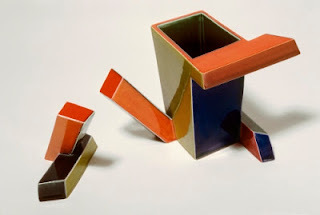 Although he has explored architecture, furniture design, large-scale sculpture, and painting (in clay of course), he always returns to ceramics as his main art form. 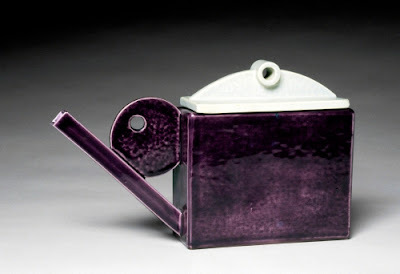 His earliest explorations in the medium were sculptural, geometric interpretations of the teapot, which he continues to create to the present day. While he rejects the idea of a linear progression in art forms based on past styles, his work does strongly reflect the ideals of Bauhaus, Art Deco, and the pioneering California ceramic artists Peter Voulkos (1924–2002) and Ken Price (born 1935). These two artists were particularly influential for liberating ceramics from the stereotype of strictly a utilitarian form. Shire also produces interpretations of the sake pot, a natural extension of the tea pot. It is a logical stimulus from the multi-faceted Asian culture of Los Angeles. This particular pot combines the traditional configuration in Bauhaus- and Art Deco-inspired shapes, combining utility with aesthetic emphasis. Bertha Lum was a printmaker who spent much time in Japan studying the traditional woodblock printing process typified in the Ukiyo-e style. 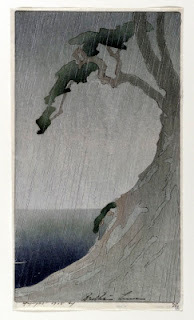 This print reminds me of Hiroshige. Learn more about Lum in my first East-West Influence post. I’m not quite sure if this artist ever actually saw an Asian woman. What’s she wearing anyway, a bathrobe? The only connection I can figure out is a vague reference to Chinese tomb figurines from the Tang Dynasty (618–907 ce). 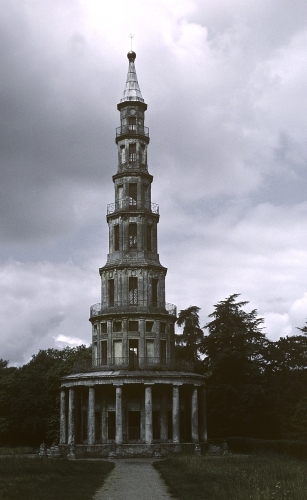 This whimsical pavilion is on the grounds of a country palace. Although it owes the stacked levels to the pagoda form (vaguely), each level with its columns and arches is firmly within the popular Western style of the time: Neoclassicism. 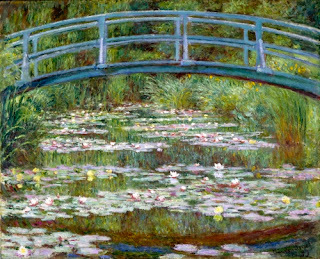 I don’t think Claude Monet intended to present his series of the Japanese bridge in his garden at Giverny as a strict interpretation of Japanese architecture. However, his reverence for nature certainly places it in the ballpark of Japanese aesthetic. 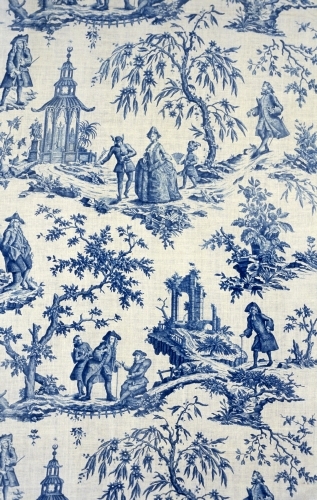 Whether imitating Chinese, Japanese or Korean art, Western designers termed such fancies as “Chinoiserie” (literally Chinesery). 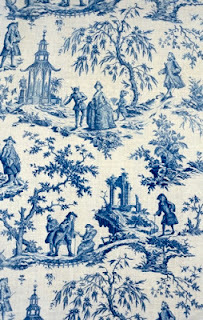 Such motifs often combined influences. An interesting interpretation by Eduardo Paolozzi of Japanese religious subject matter executed after World War II (1939–1945).